I couldn’t resist reading one more book on history that I noticed, when returning the previous batch to the local library: Niall Ferguson’s Civilization – The West and the Rest from 2011. It was interesting, because his angle is the same as mine, i.e. analysis of the factors that impact the relative competitiveness of various groups of people in different times. I am jotting these notes down today, before returning the book to the library, mainly for myself. Ferguson chose “civilization” as the grouping of people for his study and analyzed it by testing his own hypothesis that the key factors that made the western civilization competitive were what he called the killer apps of 1) competition, 2) science, 3) ownership, 4) medicine, 5) consumer society, and 6) work ethics. The selection of “civilization” as the unit of competition was probably influenced by Samuel Huntington’s Clash of Civilizations from 1996. Ferguson’s argument is that these killer apps made the western civilization prevail over others during the last 500 years, but today we are seeing others “downloading the same apps” and we have yet to see how the new competition will play out. He addressed each killer app in its own chapter, probably aligned with the parts of the television series that was made as part of the book project, though I have not seen that television series. In the chapter on competition, Ferguson starts by describing the difference between the mighty Chinese Ming dynasty in the 15th century and Europe in that same period. China was by far the richest empire in the world those days, its rice based agriculture 10 times more productive than Europe’s wheat based agriculture in terms of ability to feed a population. It had long traded with more western empires over the Silk Roads, but it also had the biggest ships, which were used by admiral Zheng He to visit India and Africa decades before Vasco da Gama discovered the sea route from Europe to India. But the Ming dynasty turned inward after Zheng He’s patron and emperor Yongle died in 1424. Building of large ships stopped and overseas exploration stopped for reasons that we do not know. 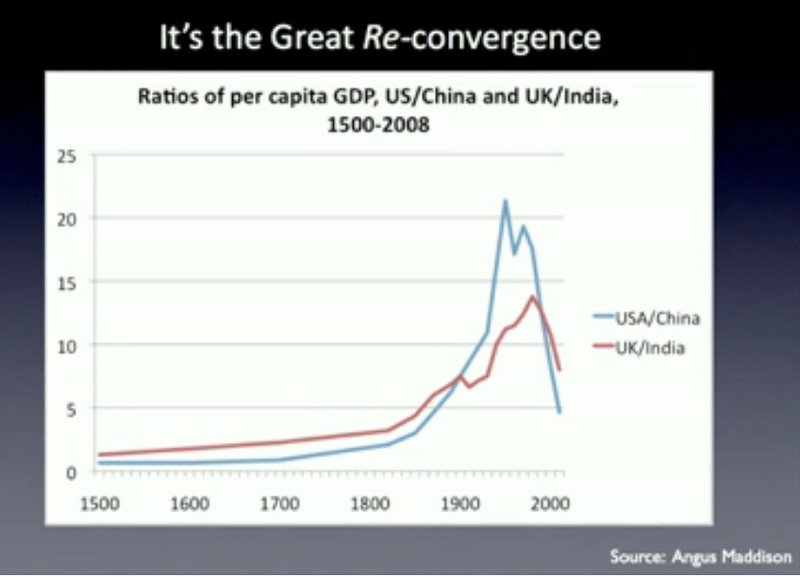 The result was that China’s growth stopped as well and its economical equilibrium turned out to be fragile. By 1650, civil wars and diseases had cut the Chinese population by 35-40%. Meanwhile, Europeans had survived the black death and continuous warfare between its small kingdoms, resulting in higher wages for the survivors and highly developed military technology based on continuously applied advances in science, which set them apart from the Ottomans and the Chinese. Europeans were looking for alternative trade routes to India in order to avoid paying duties to the Venetians merchants and the Ottomans (competition), who controlled access to the Silk Roads. The Spanish and Portuguese led the discoveries and established colonies. The English and the Dutch followed suit, but armed with trading corporations under private ownership, which set them apart from the Spanish and Portuguese. In South America, the conquistadores were given large estates to rule in exchange for paying taxes, but the land was owned by the king. It was in the interest of the descendants of the conquistadores to keep the local population essentially as slave labor for the estates. In North America, on the contrary, immigrants were allocated plots of land to own and farm giving a foundation for entrepreneurship by the landowner class. Slaves were imported from Africa both to North and South America, as well as to Europe. That wouldn’t end until 19th century. Ferguson’s argument about medicine centers on the period, when modern medicine nearly doubled the expected life of people in the west in the early 20th century and elsewhere in the second half of 20th century as it spread to the rest of the world. The industrial revolution was able to create economic growth thanks to citizen’s wanting and being able to buy its new mass produced products. Consumer society was needed and consumers became more valuable than slaves for the economies to grow. Finally, Ferguson compares work ethics to religiousness and argues that especially the protestant churches preached working hard as a form of worship in itself. What is interesting is that today, especially China and other East Asian countries have adopted all of these “killer apps” and are challenging the west in the world economy, while some other parts of the world have been slower in their adoption, being left behind. Cultures evolve with interaction and interdependence. What interests me currently is not so much the competition between ancient civilizations, but rather the means of competition in the near future, when the internet has made ideas instantly accessible from anywhere in the world, when artificial intelligence makes it possible to automate most manual labor, when climates change, and when companies are global. My point of view here is distinctly European. We are being seen as a declining continent by much of the world, but things are pretty good here in many ways. My home country Finland is measurably one of the best places in the world to live in, as are several other European countries. So could we use some of these made-in-Europe strengths to regain our economic competitiveness in the future? Could there in fact be business opportunities for our existing or new companies? Should we change the interesting units of competing entities from civilizations to local areas or nation states or companies or something else? Note: Title image (or its variant) was used by Ferguson in his book and the related TED talk. I found the graph via Google from here. Summer Reading: How empires and corporations have evolved and what it has to do with Brexit and the Turkish coup attempt of 2016? It has been a fascinating summer with the British elderly and uneducated voting for Brexit and Turkey’s military coup attempt morphing into the sitting president’s power grab by changing the constitution and purging political opponents from state institutions, all following EU’s structural problems, Russia’s new foreign policy built on hybrid warfare, and Middle East’s continued turmoil a hundred years after WW1 and the dismemberment of the Ottoman empire. I have spent my free time this summer with family in various parts the beautiful and peaceful Finland, while reading many books on history, both fiction and non-fiction, in order to try to understand better what is going on in the world around us these days. I defined this blog as my professional blog and I am not a historian, so this may be an odd topic, but I am an analyst and this is analysis albeit of the light-weight holiday variety. Soft landing back to writing mode after some time-off. Discussion welcome. I didn’t read the books in any particular order, sometimes even several in parallel. To make sense of my narrative, we could start from Tom Holland’s Persian Fire, which describes Persia as the first world empire and its losing the sea battle at Salamis 480 BCE primarily against the Greek city states of Athens and Sparta as a defining moment for the West and its emerging idea of democracy, which was first experimented in Athens in those days. Holland describes the formation of the Persian empire from nomadic tribes, who were able to defeat several city states in battles, subjecting the local kings to pay taxes in exchange for protection by the king of Persia, now the king of kings. The innovation of the Persians was a communication system based on a network of messengers in high locations with line of sight to their neighbors, able to relay messages much faster than the competing technology of a man on a horse riding between mountains and crossing deserts. In this empire, the city states and their local kings continued life much as before, speaking their own languages and following their own traditions, so the Persian empire was not a nation state in the modern sense. This may explain, why most of the city states including Greek speaking cities around the Aegean and in Anatolia (nowadays Turkey) were fairly ready to trade having to pay taxes in exchange for securing peaceful life and commerce. The ancient empires facilitated trade by offering safe travel and rule of law. Trade facilitated exchange of goods as well as mixing of people and ideas. The democracy experiment in Athens was short-lived, but the “king of kings” method of empire building continued in the following centuries, first by the Macedonian king Alexander and later by the Roman emperors, who in turn were defeated by the Arab caliphs in the 7th century in what later has been described as the “Islamic conquests” and which is the period current day Islamic fundamentalists seem to idolise. Christianity differed from most other religions of the time in that it was not bound to one place or one tribe, but rather promoted growth by conversion. In modern business terms, it was a “growth business” and already the dominant “social network” by the time it was adopted as a state religion by the Roman emperor Theodosius I in 380 CE, arguably to influence the church doctrine and keep citizens better under state control. The Silk Roads – A New History of The World by Peter Frankopan, which gives our history a new narrative from the point of view of the interactions over the Silk Road over time, describes how the Romans consolidated the teaching and structure of the church in their territories, while the eastern Christian churches continued to evolve and co-exist with the Jewish, Buddhists, and other faiths in the east before and also after the advent of Islam. Fred Donner is one of the modern historians, who has researched the earliest historical references to Islam. He found that during the Arab conquests of the 7th century, Islam was not yet clearly recognized as a separate religion. The tribal leaders from the Arabian Peninsula, who defeated kings formerly paying taxes to the Romans, acted in the name of The Believers, a common name for the Jews, the various Christian sects as well as the emerging Muslims, all of whom believed in the same God and built their holy books on the same traditional texts and myths. In those days, some Christian churches had a prayer room for the followers of Mohammed as an example of the co-existence, and both Jewish and Christian people held high offices in the court of the new Arab king of kings, the caliph. The new Arab rulers apparently gave the local kings a better deal than Romans in terms of taxation, which encouraged shifting of allegiances from Romans to Arabs. What appears to have happened next, in the 8th century, was that the caliph Abd Al-Malik (Al-Walid I) started the consolidation of his new empire and, taking a leaf from the playbook of the recent Roman emperors, codified Islam to build a new identity for his new empire, justifying its rule by his Arab tribe. Islam was the state religion and Muslims enjoyed tax breaks and privileges in the army, but the empire was multicultural and relatively peaceful. It wasn’t before the crusades that the Islamic and Christian people began to be seen as enemies, resulting in prejudice against the Christians, who had become a large multi-ethnic minority within the caliphate. The Ottomans, a Turkish speaking tribe which had recently arrived into Anatolia from modern Turkmenistan, took over the caliphate piece by pice from the 14th to 17th centuries, inheriting taxation of the trade along the Silk Roads as their business model, but didn’t really innovate anything until their fall during World War I. While the Ottomans enjoyed life as before, the seafaring Spanish acquired seemingly unlimited gold reserves in the 16th century from the kingdoms they conquered in South America thanks to superior European war technology. The other European naval powers of England and the Netherlands had to invent something new and revolutionary to compete. This innovation is described in Philip J. Stern’s The Company-State: Corporate Sovereignty and the Early Modern Foundations of the British Empire in India. The English (later British) East India Company and the Dutch East India Company were the prime examples of the 17th century corporation, which employed private investors to complement the king’s national reserves to fund ships and settlements in India, elsewhere in Asia, Africa, and North America. These corporations defended their settlements with their own armies, pressed their own coins, collected taxes, and made their own treaties with neighboring states, all the while paying taxes to their homelands in exchange for trade monopolies. In other words, they behaved much like the old vassal kingdoms within empires of the past. It wasn’t until the 19th century, before these corporations were restructured into their modern form, whereby their only duty is to make a profit to their shareholders and the nation states take care of law, order, currency and taxation. By this time, Britain had become the world’s leading empire thanks to the riches of India brought to it by the work of the East India Company over a couple of hundred years. Britain was also home for the industrial revolution, which enabled to reversing the direction of trade of textiles and ideas over the modern Silk Roads. With new sea routes open, the Ottomans were able to tax less, becoming poorer. Turkey tries to evolve Kemal Ataturk’s post WW1 nation state defined by Turkish language, Islam, and a European nation state ideal by looking into an idealised Ottoman past, but ignoring the traditional plurality of the population inhabiting its current geographic area, roughly the traditional Anatolia on the Silk Road, and also ignoring the speeds at which information flows in the Internet and people now travel, which is quite different from the times of the Ottomans. Syria and Iraq are breaking up under the conflicts created by tribal leaderships. Britain and the US supported these and other autocratic tribal leaderships in the region to get stability and cheap access to natural resources by the oil companies, which were needed to fuel their industries and way of life. Like Turkey, they ignored the other ethnic groups that have lived in the same lands for centuries – now unable to come up with ways out of the impacts of their policies over the past 100 years. In the meantime, European Union is becoming a museum for American and Chinese tourists, while the US and Chinese companies dominate world economy and innovation. EU’s home market is still fractured. It is typically easier for European startups to scale in the US than in Europe. EU’s security still relies on the US military spending, which Donald Trump and Vladimir Putin are happy to emphasize. Europe’s population is aging, while the pool of young people in neighboring countries live in failed states without hope for advancement. So the British elderly and uneducated got scared of the refugees and migrant workers, deciding to vote for a return to presumably happier times in the British empire of the 19th century, while the Turkish president decided to go back to the Ottoman empire of the past… Neither of which is feasible today, because neither the British nor the Turks can use their old business model of taxing the trade within their former empires and both British and Turkish companies need competitively priced access to foreign markets. As an analyst, who has been working on the competitiveness of technology companies, I see all of these huge structural problems within and around Europe. As an entrepreneur, I see the problems as huge opportunities for innovation. I’ll return to competitiveness and innovation opportunities in later posts. P.S. For a glimpse on what life may have felt like along the Silk Road in various times, I recommend the entire bibliography of Amin Maalouf (historical fiction). I read everything from him that I could find from my local library. Author nouriwerdiPosted on August 17, 2016 Categories Analysis, BooksTags brexit, commerce, corporations, empires, history, markets, silk roadsLeave a comment on Summer Reading: How empires and corporations have evolved and what it has to do with Brexit and the Turkish coup attempt of 2016? Playbook blog Blog at WordPress.com.